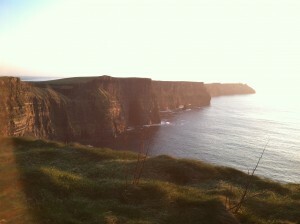 When I came to Ireland, I had two VERY IMPORTANT things I wanted to do/see. I shall explain both of them. The first one is related to the book The Wish List by Eoin Colfer (of Artemis Fowl fame). In it, a man explains that there are many things people must do before they die, but one of them is spit over the Cliffs of Moher. Photo credit to Mr. Fattor. 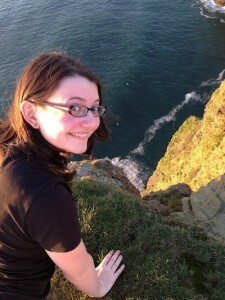 Just for reference, the Cliffs are actually worth seeing and not just spitting over. Anyway, that’s Life Goal Number One down! Life Goal Number Two owes itself to Where The Hell Is Matt?, or at least that’s the source I can remember. 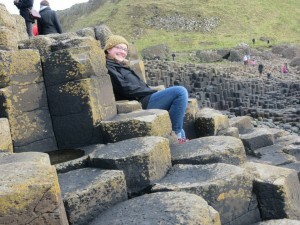 I wanted to experience the Giant’s Causeway. Oh man. It was exactly what I’d hoped for. The beginning was worryingly touristy, with a gift shop and a lot of people with maps and cameras and audioguides (I got one and named it Stephen). There were mobs of people streaming out of that center on the short hike to the Causeway itself. I got nervous. Then I saw the herd thinning out, and once we reached the Causeway, the cowards backed away from the slippery rocks, the roaring sea, the shaky or sheer stones littering the Causeway. 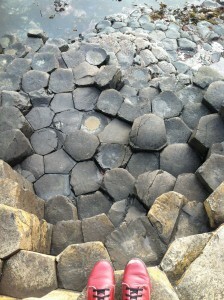 What can I say, rock formations make me happy! Photo credit for that one goes to Dana Thornquist. 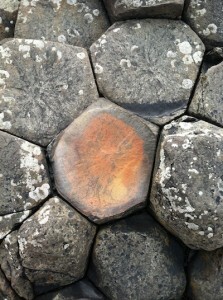 Anyway, I spat over the Cliffs of Moher and tucked myself into the Giant’s Causeway. This past week was an eventful one. My next post will most likely be about Belfast, so stay tuned! You’ll get a history lesson and a bunch of strange pictures to go along with it! 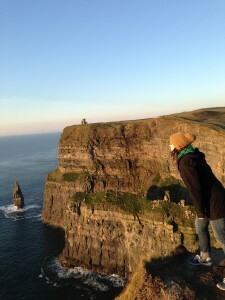 This entry was posted in Hannah Fattor '14, Ireland. Bookmark the permalink.